As the Vice President of Product Management and Innovation at Intuit, Inc., a leading software company known for products such as Quicken, QuickBooks, and TurboTax, Roy manages Intuit’s R&D Labs and advises and guides investments in new products and services across the company. He helps break down barriers to innovation, fosters an environment where innovation is a way of life, led from the top company executives and embodied by employees committed to improving and creating products to delight their customers. He has a razor-sharp intellect, is open and approachable, and is committed to doing everything he can to advance innovation at Intuit and to bring together a community of innovators across corporate and industry lines. I interviewed Roy to get his thoughts on the status of innovation, how his company has embraced and institutionalized it, and the tools and resources Intuit has found to be most helpful. Roy Rosin: There are many different kinds of innovation and they have different purposes: to drive long-term growth; to identify and improve unsolved problems; as a business model; as a technology-driven process to increase the efficiency and speed for product information. Today’s economic environment should have no impact right now. Companies need to realize that continuous investment in both good and bad times for product innovation is necessary to long term survival. Product innovation doesn’t always pay off immediately. It sometimes takes a couple of years. Companies that have thought it through know that you invest before you need it. The current economic climate sharpens the focus and leads to increased opportunities to improve problems others may have missed. When we initially began the innovation climate at Intuit, we did not always balance the long and short term investments. When cuts were needed, we cut innovation. Then, a couple of years ago, we studied innovation and what made the difference between a good and bad outcome. We have accepted that breakthrough innovation requires the ability to withstand failures and to take the long view. We decided to embrace the long view. I mentioned our internal look at innovation over the last few years. We took a very hard look and benchmarked innovation. We created unstructured time for our employees to pursue projects and issues that are not necessarily related to their job. They spend ten percent of their time on these projects. This is to foster the entrepreneurial spirit of our people. We gave them time and protected that time for them, and cleared obstacles that get in the way. We created an environment that made it possible for them to solve customer problems instead of dealing with internal obstacles. Our senior leaders and executives are sponsors of this environment. They know we have to innovate to grow, and by creating our internal pockets of innovation, our people can grow and help us build success stories. We hold whole day events to share the innovative products created by our staff. This is a forum to share what we’re doing with one another and with the company’s senior executives. We present awards for the most successful of these. They present their new product ideas and developments and we select the most promising for production. The result of our internal innovation program and commitment is that the energy level and output of the company went through the roof. For example, one of our strategies involved looking at mobile and cell phone pervasiveness in today’s environment. Our clients—small businesses and consumers—had cell phones. One of our engineers in the Small Business Division developed an idea during her unstructured time. The idea is to make QuickBooks available on customer’s iPhones. She got it working within weeks, our Executives gave her resources to complete it and she put out a beta version a few months later. This shows what’s possible when you keep obstacles out of the way of the employees. Our pipeline is dramatically different because of this policy. Instead of rolling out a handful of things a year, we now have 85 new products ready for release through our IntuitLabs.com. We have the ability to form small teams to build nimble technologies, beat the learning curves and put it in the customer’s hands. This is much more powerful than traditional research. Another example of is a team that came up with a new product called "View My Paycheck"—small businesses cannot always offer their employees the ability to view their paychecks and make small changes online. Our team saw this as an obstacle that could be overcome. They created an online platform for self service that can be offered at low cost to small businesses. From concept to beta, they did this in three months. JG: Do you use outside consultants to assist in your innovative processes? Do you use any online companies to help with outside innovation? Roy Rosin: If we outsource, we do it fast and in small teams. We don’t generally outsource. Only if our internal resources and teams do not have the organic capability to do a particular part of our development will we outsource. We have a lot of relationships and network throughout Silicon Valley and beyond. JG: Do you use social networking for any of your innovative processes? Roy Rosin: Not formally. We use it more to explore it for our products. We have developed Facebook applications. We stay on top of what is going on in the world as it relates to solving our customer problems and how they use technology and could potentially use technology, whether through social networks or other outlets. JG: Do you use any ideation, thinking, problem solving, creativity tools, or innovation software at Intuit? Roy Rosin: Yes. The cornerstone of our innovation is through our Web 2.0 tool, “Brainstorm.” We use it when ideas have not been fully formed and we need to evolve the idea, to collaborate, and to support the ideas. It’s an easy way for ideas to get to the forefront in the company. We connect people through their skills and interests, ideas, and build teams. It is our idea repository. It has been so successful that some of our clients are asking us to license it. JG: What innovation training methodologies do you use? Roy Rosin: We use Clayton Christensen’s philosophy for our training, as well as some Six Sigma for processes. These form the framework. For design thinking we use Ideo’s Design for Delight—end-to-end progress, create lots of divergent solutions and get to rapid solutions. We also do some workshops. Basically, though, training is not our focus. We believe that we should have an overall company belief and practice in innovation where it is part of what we do, and it is. We believe in immersive and experiential learning. Teams use real data and real projects in real time to create new products and overcome problems. We have videos that we make available to employees to understand what it means to disrupt, to have a group of serial disrupters. JG: Do you have a required or recommended reading list for Intuit employees? Roy Rosin: We familiarize our employees with Clayton Christensen’s books, with Harvard Business School case studies, and with articles on innovation. JG: What have you done to overcome the barriers to innovation? Roy Rosin: Each of our teams has a sponsor or senior mentor. My job is to look for common themes and barriers and bring people together to resolve them, to build internal relationships to resolve the issues. We have brilliant innovators at the top of our company that can break sticking points. We make sure folks get the visibility they need, and know the processes to solve problems. We are committed to building a culture of innovation. We are building through our success stories and evolving every day. We are about 2/3 of the way to having a fully engaged innovation culture. JG: Thank you for a very informative interview. Are there any final thoughts you would like to share? Roy Rosin: The process of creation and solving problems fascinates me and a bunch of people here at Intuit. The whole process of bringing something new into the world is very rewarding. Roy Rosin holds the position of Vice President, Product Management & Innovation at Intuit Inc., a leading software company known for its Quicken, QuickBooks and TurboTax products. In this role, Roy is responsible for managing Intuit’s R&D labs as well as advising and guiding investments in new products and services—with focus on web and mobile platforms—across the company. In working with Intuit’s business leaders and innovators, he has helped change how the company manages new business creation, allowing small teams pursuing new areas of opportunity to get to market and experiment rapidly. 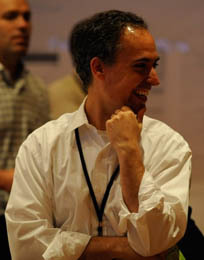 Prior to his current position, Roy was General Manager for Intuit’s personal finance division where he was responsible for growing a $115 million portfolio of businesses, including Quicken software, Quicken.com and services such as Quicken Bill Pay. He led a team of 120 people to achieve record profitability and product leadership that captured every major software industry award, while growing an active user base of 15 million consumers. Roy began his career at Intuit leading the Quicken product teams as Product Manager and later Director of Product Management. Before Intuit, Roy received his MBA from the Stanford Graduate School of Business. He graduated with honors from Harvard University with a concentration in Economics.